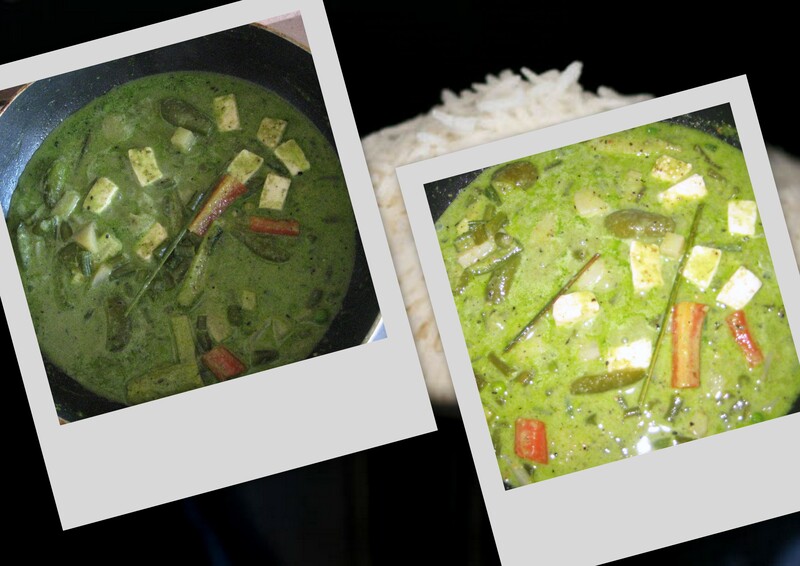 A Quick Veggie Thai Green Curry! 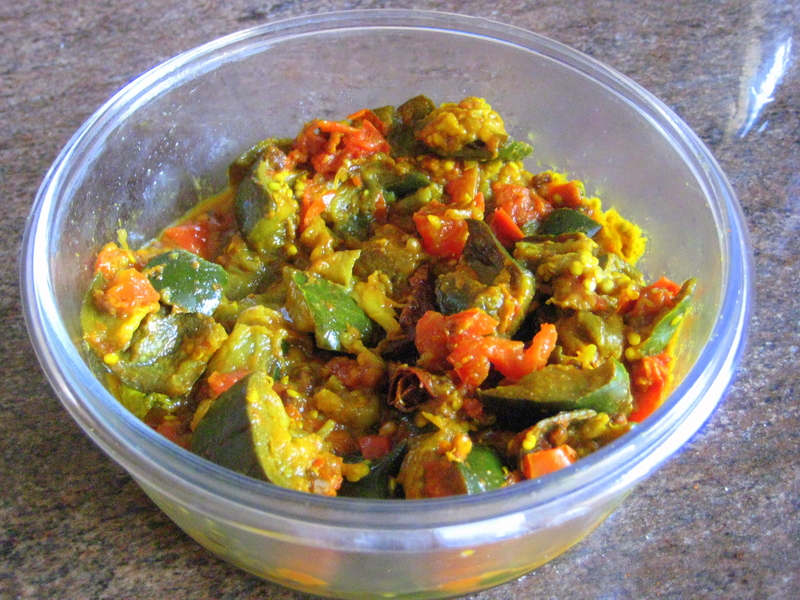 Put all the veggies (except the bell pepper) in a pressure cooker and take it down just as it is going to whistle. Quickly Run the cooker under some water to let the steam off , so that the veggies have a bit of crunch in them. Then use 1 tbsp of olive oil in a frying pan and let the bell pepper and some onion fry until translucent. 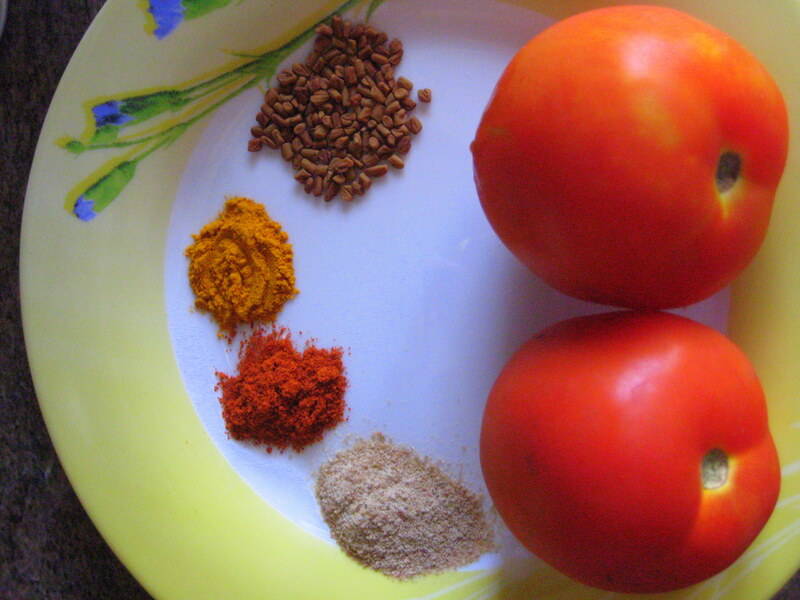 Add in the ground paste and the coconut milk until you have the light green color that you want. (Be generous with the coconut milk). I used 1 entire pack of the “homemade” coconut milk. Once it starts boiling, add in all the veggies.Put in some paneer/tofu too. Tofu would give a better “thai” taste than paneer, but according to availability you can use either. Also add 2 lemon grass stalks at this stage and put in some dried basil on top and let the entire thing simmer for 5-10 minutes.Add Salt according to taste and a 2 tsps of sugar for that slightly sweet taste. And well, thats it! You have your quick thai green curry. 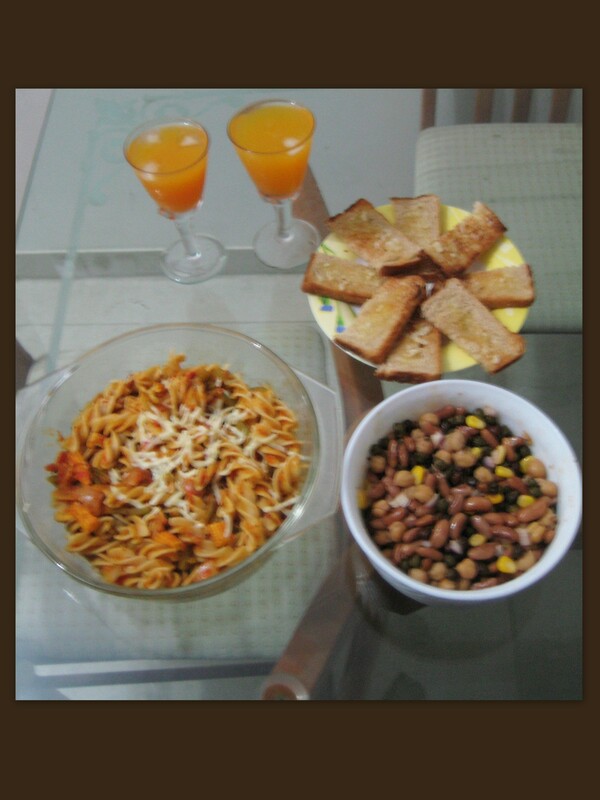 This time I decided to try out some “international” recipes and I went with three bean salad, pasta, garlic bread and mango mocktail. 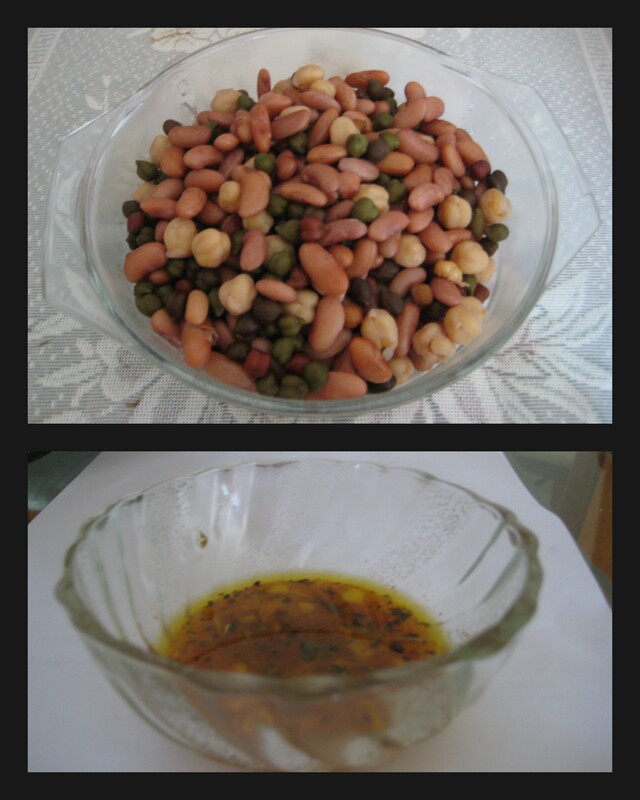 Let me start off with the recipe for the Mexican Three bean salad. Soak the beans for 3 hours or more and then pressure cook it for 3 whistles. Boil the fusilli in water with some salt according to instructions on the package till it becomes soft . Add some olive oil in the mixture before boiling so that the pasta does not stick together. Use some olive oil to fry the onions, garlic, green chilli and cinnamon stick for 2-3 minutes before pureeing it using a blender. Add the salt,sugar, some basil leaves and mixed herbs. Let ithe mixture simmer on the stove until the volume reduces to just above half. Fry all the vegetables – Onion , Capsicum and Babycorn seperately in olive oil adding some salt according to taste. Mix the vegetables to the sauce and let it simmer for a minute or two. 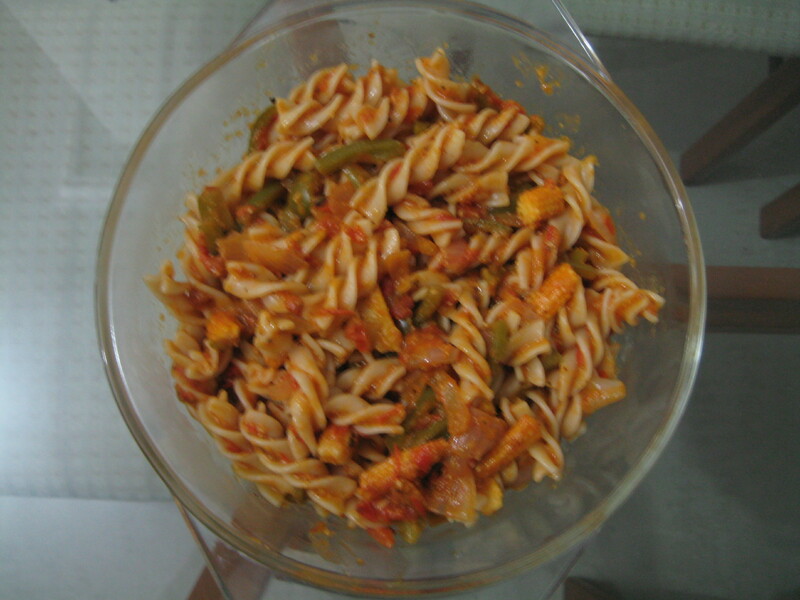 Mix the Pasta with the vegetable and tomato sauce mixture and tadaaa..
Yummy Pasta all ready to be eaten. Serve chilled with lots of ice. It was a really good accompaniment with the pasta, garlic bread and the three bean salad. Hello..I thought I should enlighten people on how to make Pasta with white sauce real quick and with minimal ingredients. 4. 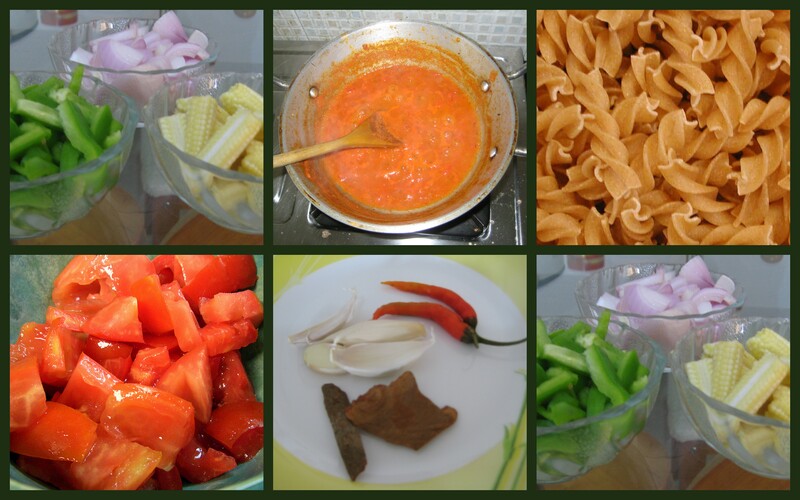 Mix the thick milk paste (also called bchamel sauce), boiled macaroni and the fried onions.